Third Luxe book and my favorite cover to date. Could just be that it's Diana on the cover and she's my favorite character...but I really like the dress. Actually, this is my favorite book of the three as well. And I really wasn't sure it would be. What with Henry and Penelope being...shudder. But this one seemed the most real. People grew up and, in a couple of notable cases, grew spines. Whether or not it will all be too little too late remains to be seen. The fourth (and final) Luxe book, Splendor, is due out in October and will hopefully settle a few things satisfactorily. 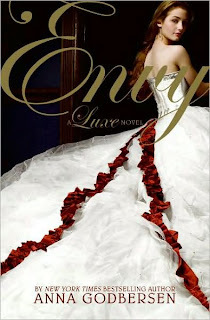 Envy begins just a couple of months after the disastrous conclusion to Rumors. Elizabeth is inexplicably back on the scene, but not really there. Diana is floating through a fog of numb and trying to rise above the crushing blows that keep coming her way. Ditto for Henry. Lina is capitalizing on all her success and makes a surprisingly apt romantic choice. And Penelope is Penelope. You just want someone to stash her in a broom closet for Two Seconds so everyone else can take a deep breath and perhaps hatch a plan to put her in her place once and for all. And amid all this, everyone manages to sweep off on a trip to Palm Beach where much of the book takes place. I liked the change of scenery in this one. Putting everyone together in a Florida beach hotel for several days on end forced them all to interact despite the myriad tensions criss crossing between them. It also provided several quiet moments in which several characters reflected on how they ended up in the nasty mess they're in. It was nice to see some talk of doing the right thing at the cost of short-term (even long-term) happiness. Though I do hope happiness is in the cards for the most deserving (read: Teddy, Elizabeth, Diana, Henry). I liked this one best because it seemed the most natural. Every single character, at one point or another, was able to see beyond themselves for a moment to the people around them. I hope they remember what the view was like. This continues to be a diverting series and I look forward to its conclusion. Hope it comes in for you soon, Rachel! I was happy to see the last one is coming out this year as well. I really, really hope things work out for Teddy! I really liked seeing more of him in this book. Hey, Lana. Thanks for the linky love! I adore Teddy as well. And I am very nervous about both of the soldiers coming back safe. Angie, I skipped reading your review... I just jumped to your last sentence. ;) I've been meaning to order this one for a few weeks now... and still need to read Rumors. I agree that it this series is a diversion.... and can also anticipate agreeing that I'll be looking forward to its conclusion as well. LOL! Christine, grin. Feel free to jump around at will.